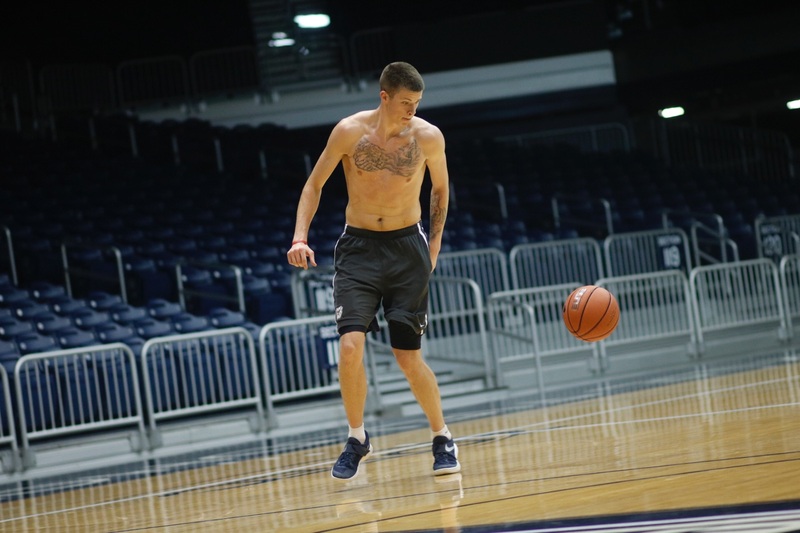 Butler basketball redshirt sophomore Sean McDermott dribbles the ball in open gym at Hinkle Fieldhouse. McDermott has gotten three tattoos since entering college. Photo by Jimmy Lafakis. Butler men’s basketball players’ tattoos depict tigers, jaguars, and scriptures. Each work of art has its own story, tales which are packed with meaning. Some members of the Butler University men’s basketball team have decided to use such tattoos to express themselves. Freshman guard Cooper Neese has three tattoos on his arms and chest. Neese has his initials in Old English lettering on his triceps, while his chest tattoo shows the Bible passage John 3:16. Neese said he believes some people make assumptions about people with tattoos. Senior forward Tyler Wideman leads the team with nine tattoos. Wideman got his first tattoo as a birthday gift during his sophomore year of high school, but the thought lingered in his mind well before 2012. The player known as “Big Cat” describes one tattoo as a fan favorite: his tiger tattoo he got before last season. The tattoo stretches from his right elbow to his wrist. Redshirt sophomore Sean McDermott said watching his mother, Kim, fight thymus cancer last season influenced his body art as well. McDermott thought he would never get tattoos before starting college, but said he became open to the idea once he arrived on campus. He got two tattoos on his chest during his freshman year. The guard/forward said the ‘Kim Strong’ tattoo carries great meaning for him and his family. His other tattoo shows a pair of hands holding a basketball with the words “In God’s Hands” above it. McDermott continued the theme with stair steps through the clouds leading to the gates of heaven. Family ties also impacted the tattoos of sophomore center Joey Brunk. Brunk’s father, Joe, passed away on April 15 of this year due to brain cancer. Brunk said he wanted to have a constant reminder of the man who always supported him. Brunk has two other tattoos which remind him of his relationships with his mother, Helen, and younger brother, Johnny. His owl tattoo on his inner left forearm represents his mother, while his half-jaguar/half-panther chest tattoo is an ode to his brother. Brunk said he will always have his family members alongside him in life. The needle that threads several players together is tattoo artist Brandee Gordon. Gordon owns Native Ink Tattoo in Elwood, Indiana, and has tattooed past and present Bulldogs. Gordon, who has nearly 13 thousand Instagram followers, has worked as a tattoo artist for 20 years. She tattooed Wideman, McDermott and Brunk. The word has spread quickly. When Wideman arrived on campus, he itched to add to his collection. He looked to an on-court rival and off-court friend for recommendations. Brunk, who played his freshman year of high school at Park Tudor School in Indianapolis, said he learned about Gordon through his Butler teammates. McDermott said he would never get a tattoo that had no meaning behind it.